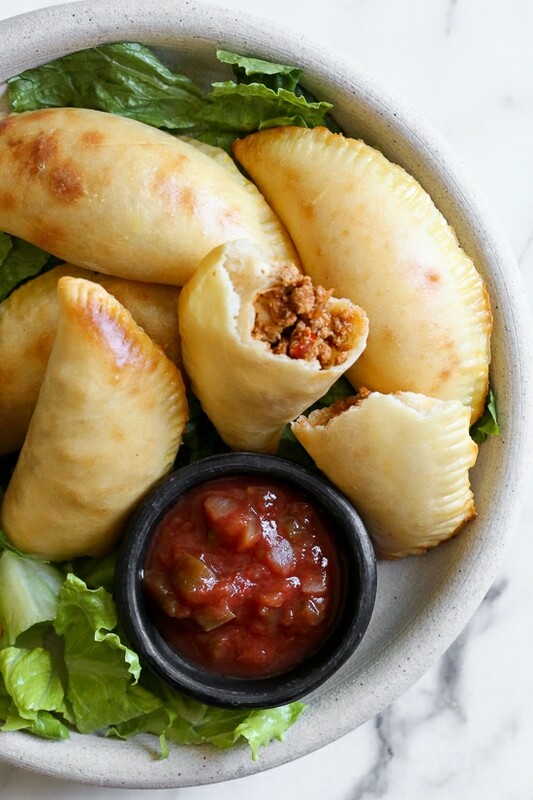 These taco empanadas are made from scratch with my ground turkey taco meat and my quick and easy pizza dough recipe! The texture of the dough, which is similar to this bagel recipe and easy garlic knot recipe, is closer to a calzone or hot pocket, but who cares, they came out delicious and so much lighter than using the frozen empanadas discs which means you can eat more for less! 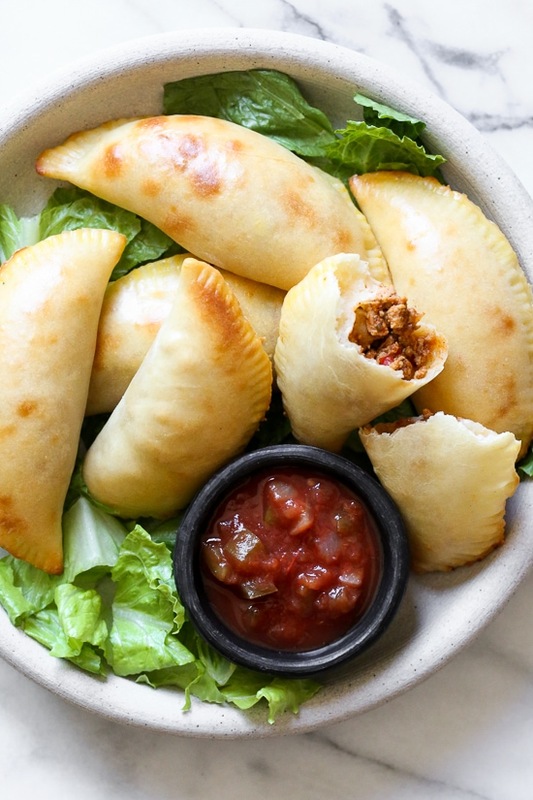 Empanadas can be filled with just about anything you can think of, I usually make them with picadillo but why not taco meat? 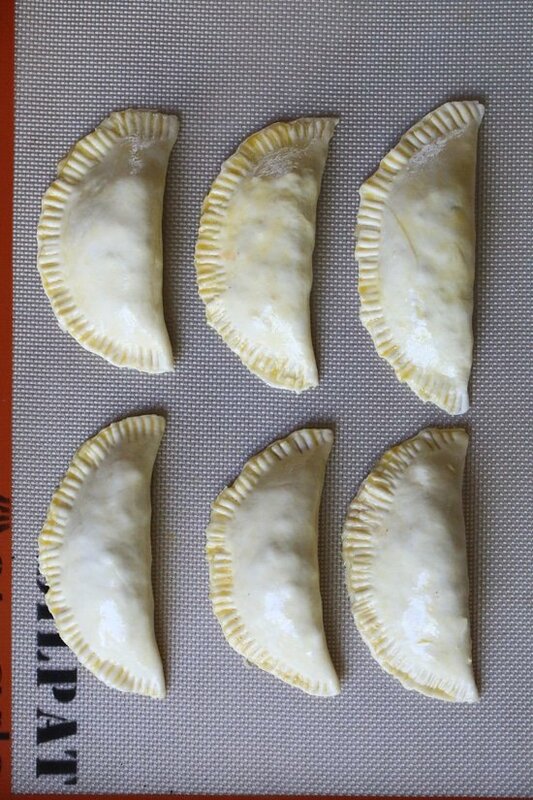 I put them to the test, and my youngest Madison who loves empanadas ate four, she loved them!! I usually buy the frozen Goya empanada disks, but many of you tell me they aren’t available near you so I decided to test them out with my pizza dough recipe and they worked out great, with a slightly different texture of course, but no added fat and less calories means you can eat more! Of course, if you wish to use the frozen discs, go for it! To cut the rounds I used a small glass jar and cut out 10 4-3/4-inch circles. Do do this you want to roll it out as thin as possible, then cut as many as you can. Roll the remaining dough and repeat. 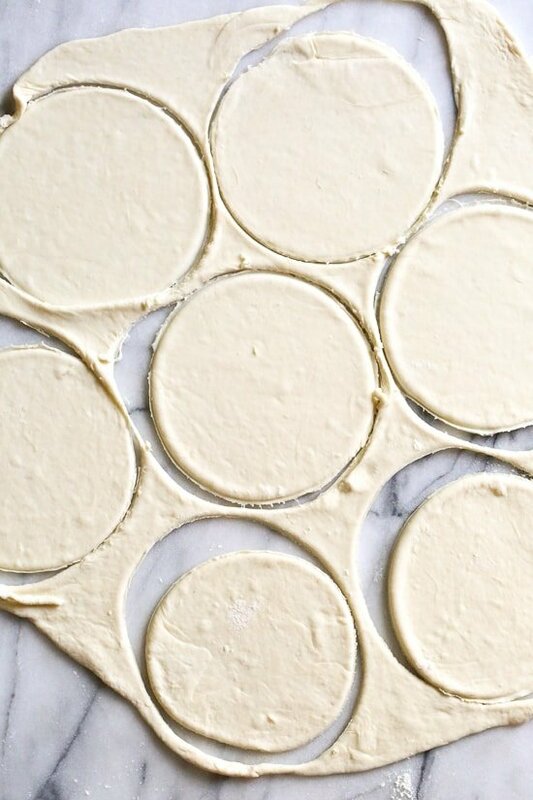 If you have a large round cookie cutter, even better. Serve these for lunch, pack them in your kids lunch box or serve them as appetizers with salsa! To make the dough, you MUST use a thick Greek yogurt such as Stonyfield or Fage. It won’t work with Chobani, the dough will be too sticky. It also won’t work with plain yogurt. For dairy-free, omit the cheese and replace the yogurt with Kite Hill Dairy Free Greek Yogurt (blue label). 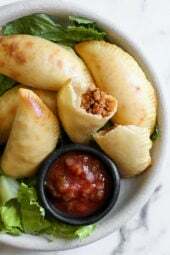 These taco empanadas are made from scratch with my ground turkey taco recipe and my quick and easy pizza dough recipe! 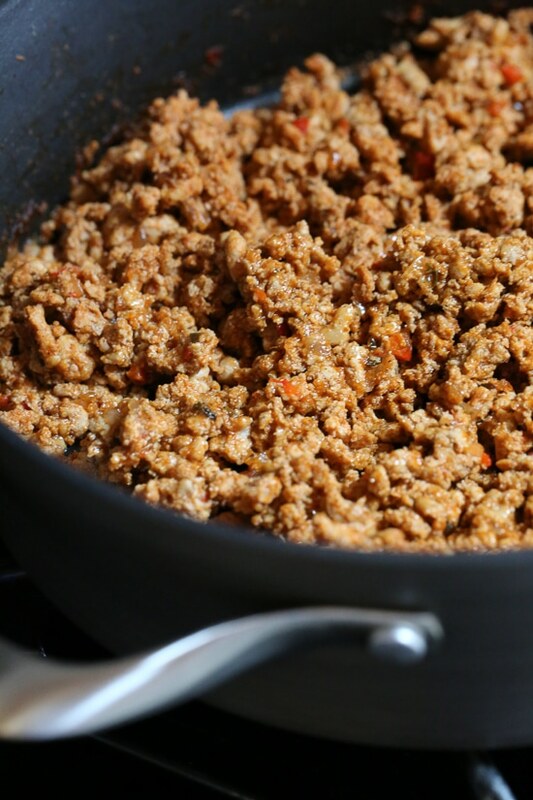 Brown turkey in a large skillet breaking it into smaller pieces as it cooks. When no longer pink add dry seasoning and mix well. Add the onion, pepper, water and tomato sauce and cover. Simmer on low for about 15 minutes, uncover and simmer until dry, about 8 to 12 minutes. You don’t want any liquid remaining, it will make the dough soggy. Place parchment paper or a silpat on a baking sheet. If using parchment paper, spray with oil to avoid sticking. In a medium bowl combine the flour, baking powder and salt and whisk well. Add the yogurt and mix with a fork or spatula until well combined, it will look like small crumbles. Lightly dust flour on a work surface and remove dough from the bowl, knead the dough a few times until dough is tacky, but not sticky, about 15 turns (it should not leave dough on your hand when you pull away). 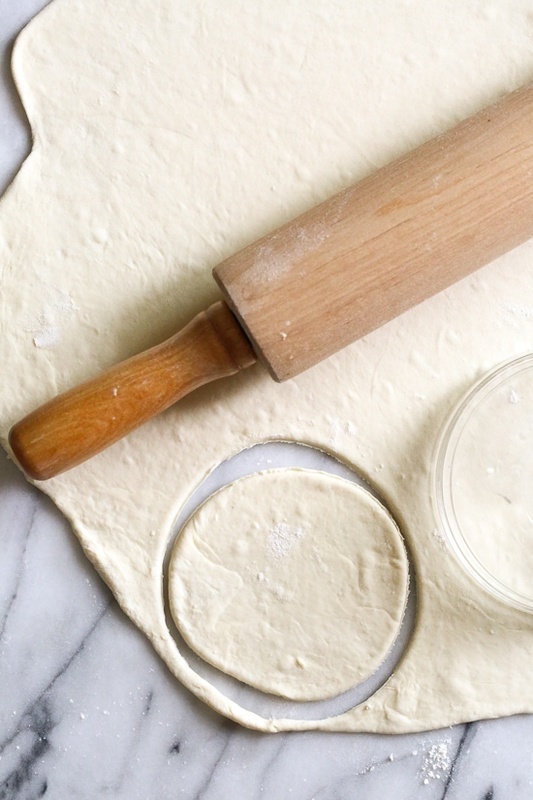 Place on a floured work surface and roll the dough out until it’s very thin. Cut circles about 4-3/4 inches (I used a small work bowl turned upside down) cut out as many rounds as you can. With the remaining dough, roll out and form into more rounds. I got 10 altogether. Place 2 tablespoons of the meat mixture on each round topped with 1/2 tablespoon cheese. Brush the edges with egg wash then fold the edge over and crimp with a fork. Transfer to the baking sheet and brush the tops with egg wash.